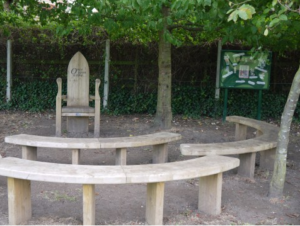 There has been a recent move for many schools to consider redesigning their outdoor space to facilitate a variety of functions. In many Church schools this has included areas to encourage pupils to reflect, find quiet and calm and to allow for prayer, reflection and peer mediation. These ‘spiritual gardens’ may even be big enough to be used for collective worship in class groups. The gardens that are created are usually set apart from the rest of the school grounds in some way and have their own atmosphere that creates a special and sacred place, providing additional SMSC opportunities and adding a spiritual dimension to outdoor learning. They are usually places where children (and adults) can sit quietly and enjoy the peace and calm of natural surroundings. The garden may contain a range of features representing elements that are important to the community using it. 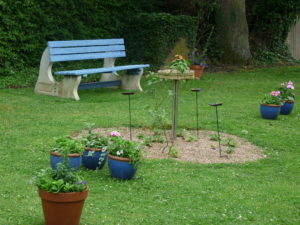 As well as a few choice plants with bright colours, fragrance and textures there may be the soothing sou nds of a wind chime; a bird feeder; a cross or Christian symbol that reflects the foundation of the school; stepping stones and paved areas; seats, benches, raised timber planting beds, and lighting. If space allows a maze or labyrinth might be considered. Gardens may be any size or shape and will be dependent upon the context of the school. For example, some schools have made use of a quadrangle in the centre of the building to establish a quiet, reflective area (as at St Mary’s in St Neots with their Zen Garden). 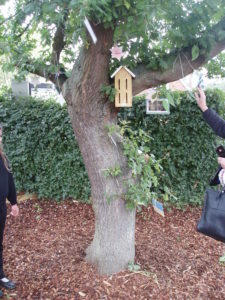 There may be “pocket sized” areas in an odd corner where each year the Y6 leavers leave something special they have created for the school, as at Great & Little Shelford. Or perhaps large scale installations as in the St Botolph’s boulders (Orton Longueville) , or Weeting’s amphitheatre. Willow sculptures, gazebos and so on may also form part of the garden. Whatever is included should contribute to the feeling of a special sacred space. It is important to involve as wide a range of stakeholders as is practicable in the planning and ideas for the garden. Ensure that everyone understands the rationale behind the project and the benefits that will ensue. 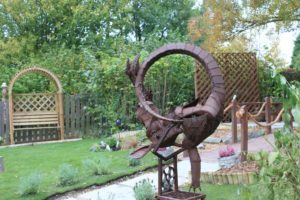 Many people can be involved in the creation, for example, by designing, planting, landscaping, building structures, laying a patio, donating plants and lots more. Think if you want to theme your garden (e.g. around St Francis and the natural world) . You can even use ideas from religious gardens elsewhere to get you started. Begin the actual design process by discussing and sketching lots of ideas—everyone who wants to can have a go – involve children (and parents) in making suggestions, even creating designs and building models. Select a working party team of ‘experts’ to collate designs and draw up a final plan for implementation. Share the final choices with the school community and think how the garden is likely to be used and by whom. Think carefully about plantings of trees, bushes, and other landscaping features. You will need to consider future maintenance and development of your garden. Consider what role the children will have in the creation of the garden e.g. making wall tiles or wind chimes. When all is completed, hold a dedication service (with your vicar or even the bishop) to emphasise the special nature of the place you have created.